So Infinity is finished. Well, not finished finished, but the top is done. After thinking this way that that I realized that there was only one way to handle that double border – unstitch it and re-sew them one at a time. Now I will pack it away, to await the call from a quilter but it will take a very long time before that happens. As long in fact, that The DH stared me and asked what I was thinking, not being able to complete it for that long. But I can be kind of stubborn too and I know what I want. When it returns home there will be some more embellishment and binding. This has been a like a 2 year project which started with an ad for the very prestigious Swedish auction house Bukowskis. 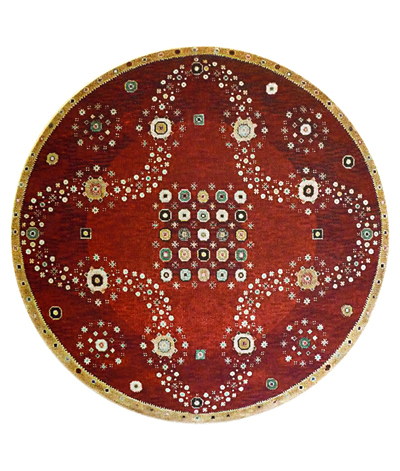 this is what I saw: A carpet designed by the Swedish textile artist Barbro Nilsson in 1944. The asking price is merely SEK 592 450 (incl. Swedish VAT 25 %). The minute I saw it I knew that I wanted to make a quilted variation of it and your who know me and have followed the process here, know how many takes of the hexagons I did 😉 And all the variations of the rest of the design…no strange thing it has taken so long to get it done. Almost everything is hand appliquéd except for the Bollywood bends and the compass needles. Some might ask why I don’t quilt it myself but 1) I don’t own a long arm machine 2) but two domestic Janome and 3) my imagination for great quilting is zilch and I don’t know why, but my brain refuse to work when I have to wring a piece though my machine. I think it is far more easy to let your body do the work of steering a machine than pushing the quilt this way and that. I do long (long, long, long) to own a long arm machine, but have come to realize that even though it may be financially possible in the future (and The DH has promised me one), I will have no support and no one to teach me, no one to ask..just me all alone here in Sweden. There are as far as I know (but I don’t know it all) only 3 people here who ones one of these marvels, but they use mostly pantographs and maybe computer aided as well. 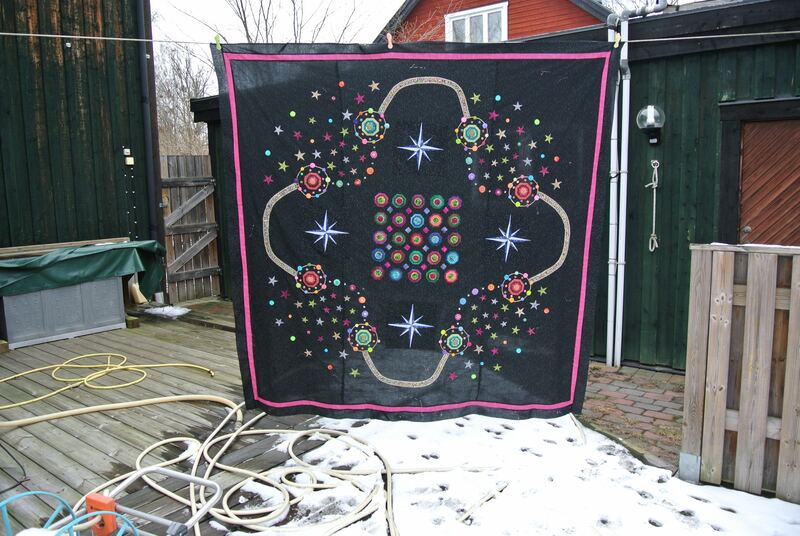 That I don’t want to do…call me snobbish but for me the actual quilting is form of real art. I know I know, one has to practice, practice and then practice some more, but it’s a vast difference between doing smaller stuff like exercise pads and try to make Infinity shine. So I find solace in the green stuff and have been to yet one more garden centre today 🙂 The silly dog Arwen is in false prejudgers and does the most stupid things, like tearing a hole in a down duvet. Thank heaven there is doggie meds for this behavior. Wow! This is a beautiful piece! Yay!!! Now whats next on your creative journey… and it isn’t just veggies!!! I’m with you on trying to shove a quilt to and fro under a domestic machine… too much work!!! What to do next is the BIG ??? Inspired by someone close to me (nudge nudge) I would want to learn thread work but have no clue on where to start. Even though I am not especially good at drawing, I made a sketch yesterday that could include both appliqué and thread work. Will see where that will go. ah, but what kind of threadwork? There are so many… painting, sketching, coloring… but I can’t wait to see where you are going to take this.